$18.98 Value! 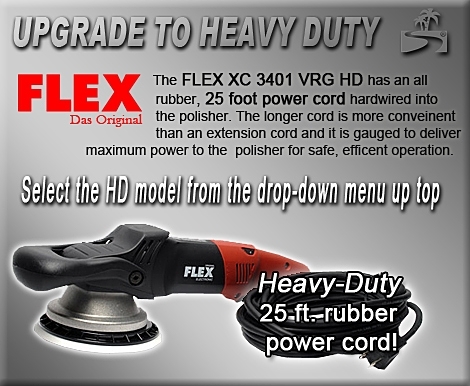 The FLEX XC3401 VRG Dual Action 7.5 inch Curved Edge Pad Kit takes dual action polishing to a whole new level with the true dual action motion of the FLEX XC3401 VRG and Lake Country CCS 7.5 Inch Pads. Remove swirls, scratches, and oxidation, and restore a showroom shine with this complete buffer and accessory kit. Foamed Wool 6.5 inch Buffing/Polishing Pads feature patented nanofoam particles that encapsulate the base of the wool fibers to help prevent caking and matting. These manufactured Foamed Wool pads polish like a wool pad but finish like a foam pad, giving your vehicle�s paint the best qualities of each. Use the Foamed Wool Pad with light compounds to remove swirls and mild scratches. Orange Light Cutting Foam 7.5"- Firm, high density foam for scratch and defect removal. Use this pad with polishes and swirl removers. It�s an all around pad that will work on most light to moderate imperfections. Black Finishing Foam 7.5" - Composition is firm enough to withstand added pressure during final finishing to remove buffer swirls. It has no cut and will apply thin, even coats of waxes, sealants, and glazes. Blue Finessing Foam 7.5"� This blue foam pad has soft composition for applying glaze, finishing polish, sealants, and liquid waxes. The soft pad has no cut, making it perfect for applying nonabrasive products evenly. A total retail value of $514.40. Save $94.41!